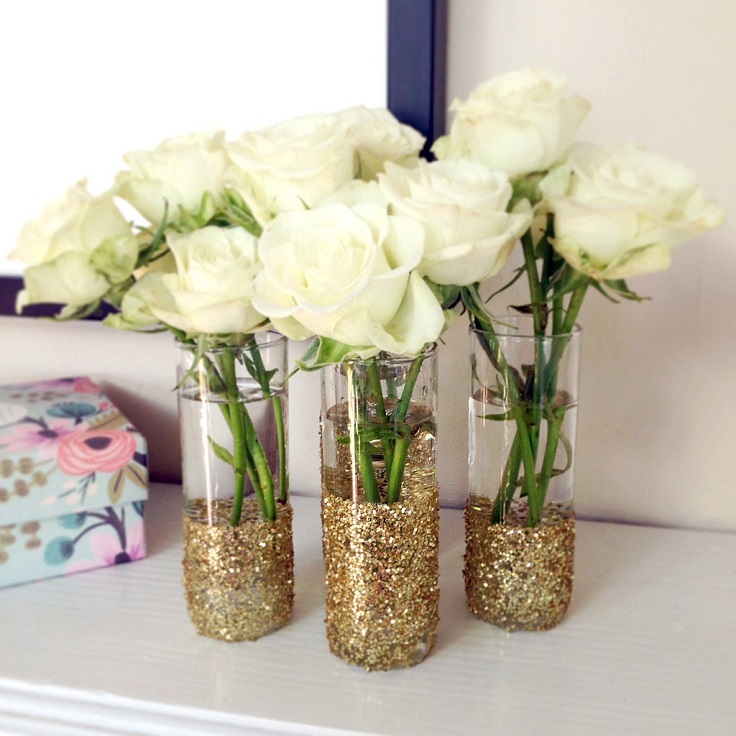 Decorating vases can be so much fun if you’re into this kind of stuff. There are so many colors, patterns, ribbons, glitter – you are literally left with so many options! All you have to do is just wake up your creativity and use your imagination to do something. Flower vases can be the small detail that makes a big difference in home decor. But, having a vase that is more than just glass is something more exciting! The best part is that you yourself can decorate your very own vase and it will take just a little from your time and money as well. See below all the ideas and see which one would fit your home the best. We love them all! 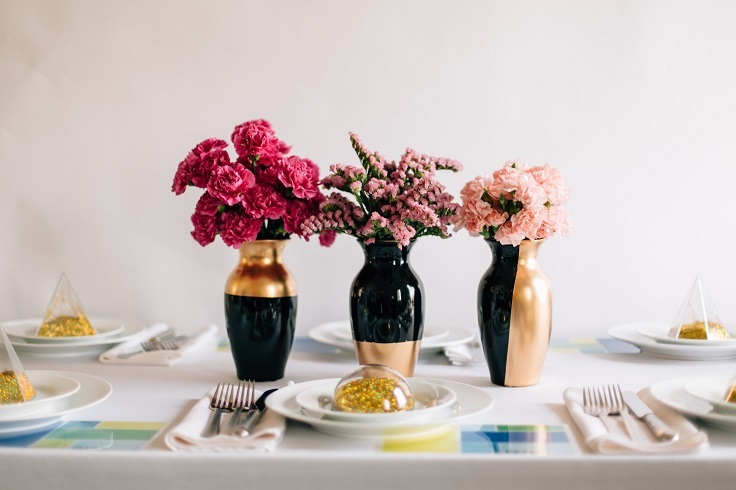 This decorations can make simple vases look a little bit of retro. To make the flower decorations, you need self drying modeling clay, paint, brushes, glue, glue gun, vase and knife. 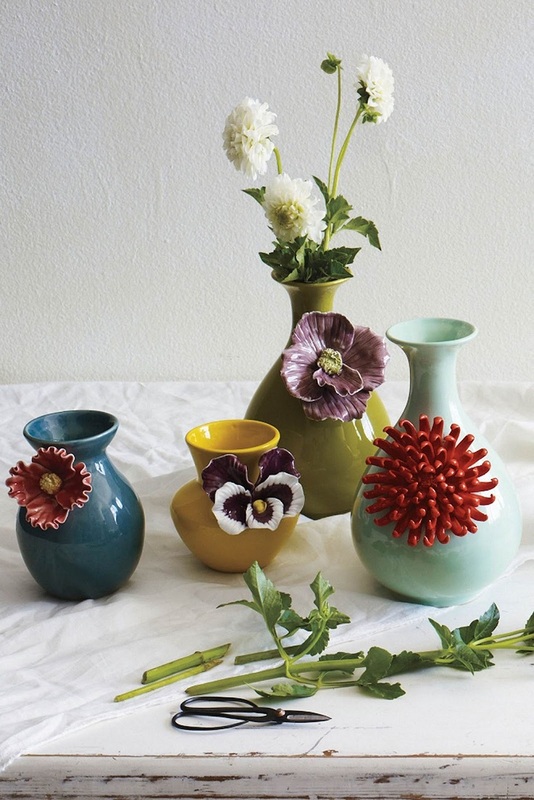 Use your favorite flower and use the clay to make it. Start by making the petals and then move to making the single inner petal. Prop your flowers against a glass and leave it overnight to dry. After that, you can paint the flower in any color you want and then leave it again to dry. When the colors are all dried, put on some glue in the back and hold the flower on the vase to glue it better. 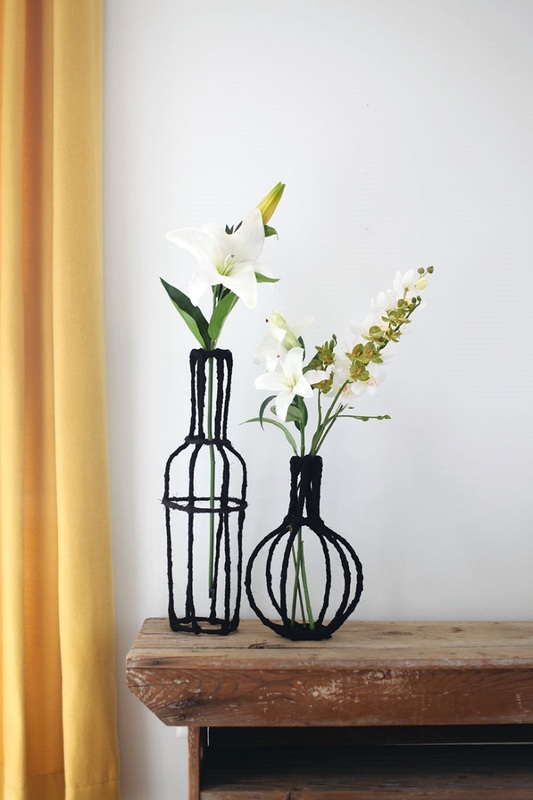 Who would thought that a regular rope can turn out to be such a great vase decoration? You are going to love this project because is certainly one of the budget – friendliest and it will take you about five minutes to make it. It’s great if you need any new home decor ASAP. Besides the rope and a vase, you need glue gun, glue sticks and heavy clip. 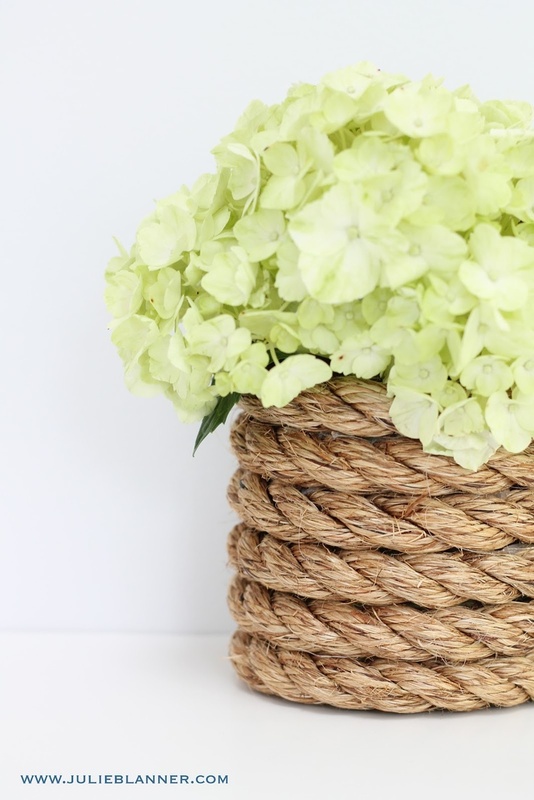 Glue the inside of the rope and move it around the vase. When you get to the top, hold the rope with a heavy clip to make it more secure and then cut it off. Next step? Place some pretty flowers inside and enjoy your own project. If you like your vase simple and glass-y, here’s something you might like. It’s a simple decoration, but it has the power to make somebody’s day. It can be perfect as a gift because you can type something meaningful, to congratulate or to wish something to somebody! 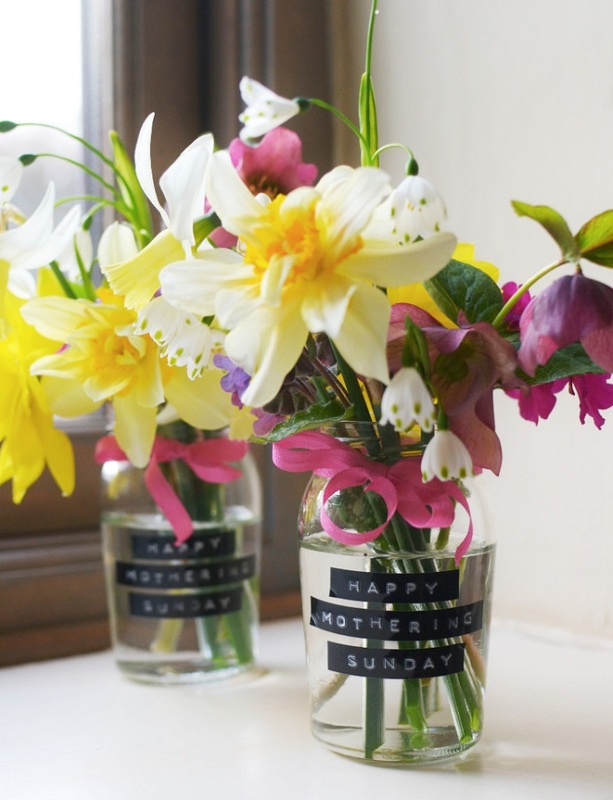 In order to have this type of vase, you can use a regular vase or a mason jar, Dymo machine, type and ribbon. If you go for the mason jar option, clean them well and remove the whole label. Use the Dymo machine to stamp your message and then stick it on the jar. Make a bow around the jar, put some flowers inside and you’re ready to go! Pastels and polka dots are one of the combination that no matter what you use them for – wall art, nail art, clothing material and in this case vase decoration, it looks super adorable any how. 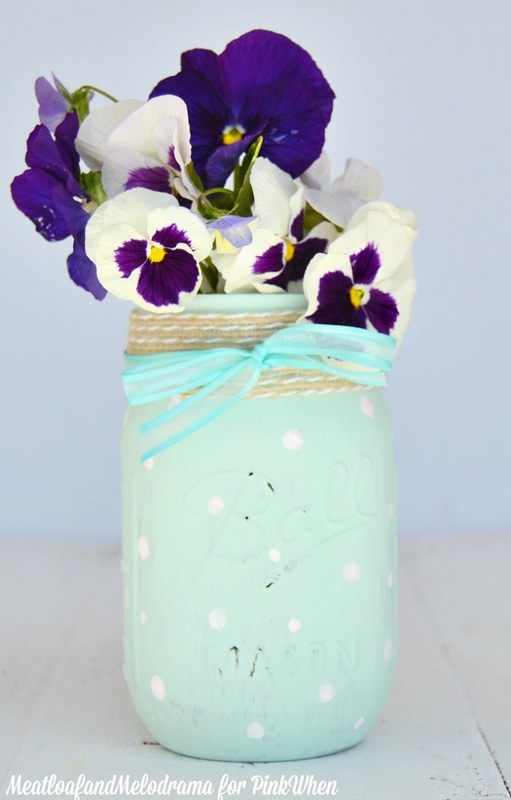 This project includes mason jar as a vase, but if you prefer you can try it out with a regular one. Besides the mason jar, you need chalk paint, brush, white paint pen or white craft paint, glue and ribbon. Clean and paint the jar in color by your choice. Let it dry and if you wish to decorate it more, you can glue a burlap ribbon around the jar. But, the best way to have this vase the prettiest as it can get is to add flowers with matching color! If you want something more DIY – challenging, we recommend this one. You’ll need heavier gauge wire, electrical tape, wire cutters, scissors, 1ʺ-2ʺ strips of scrap fabric, needle and thread, but these two are optional. This project will take you sometime to make it especially if you’re new in the DIY world, but all the effort you put will be so worth it when you’ll see what a beautiful vase you made. After you make the wire skeleton for the vase, wrap some fabric around the wire. It doesn’t have to black, instead you can choose any color or pattern that you would like. It can’t get any easier than this! You’ll need thin gold ribbon, marbles and double – sided tape. Measure and cut the ribbon and bind it to the vase with the double – sided tape. Place the marbles in the bottom of the vase. Add enough water to reach the tip of the gold trim and place inside the flowers. It’s really easy, simple and it looks great. We can totally put this project in the group of less than 5 minutes projects. It can give you the satisfaction of having a new home decor and a vase for your flowers, without spending your time and money. Straws aren’t meant to be used only for drinking purposes. They can serve as great vase decoration and this projects proves it. 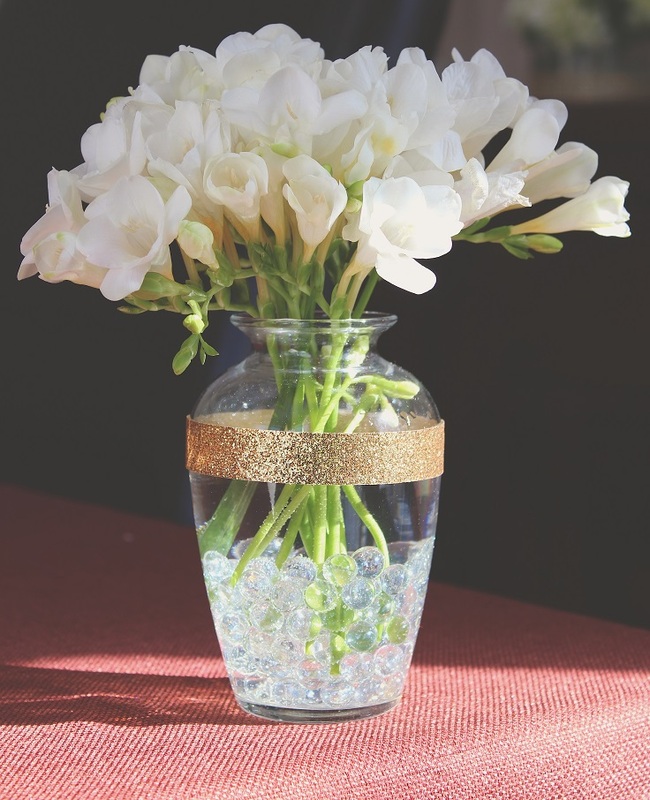 You need straight edge vase or even a can or thin, straws, decorative string and double – sided tape. The process with the decorative string and the vase is the same as the one previously shown before. 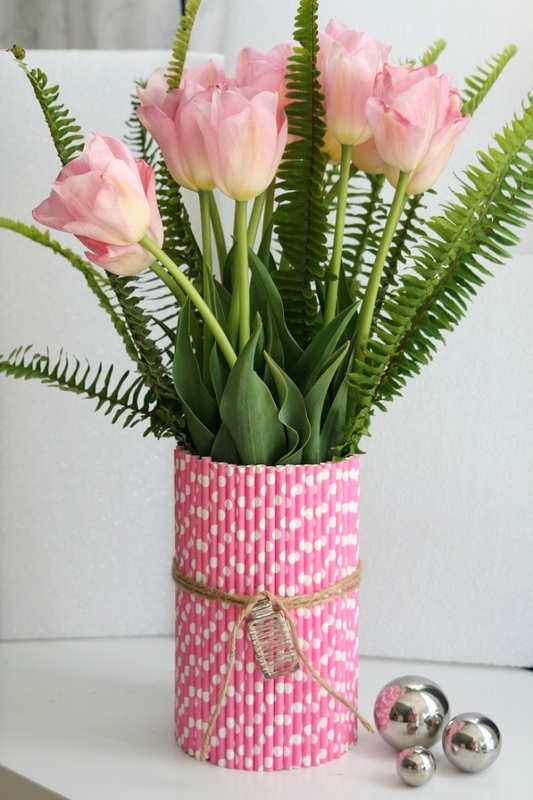 Place the string around the vase and secure it with few strips of the double – sided tape. Start putting the straws on the tape until you have it all vase covered. If you want to make it more decorative you can use a piece of the string and make a ribbon, or you can even tie an old necklace charm as on the picture. You want all things glitter? Even your vase can come up to those expectations and wishes of yours. All you need to do is to have a vase or tall shot glasses, painter’s tape, Mod Podge, brush, glitter, scrap paper and clear glaze spray paint. Protect the part of the vase that you want to be clear with painter’s tape, while the one you want to be glittery coat with Mod Podge. Roll them with the glitter and leave them to dry for 20 minutes. After that, if you wish to roll in the glitter again do so, and wait again for 20 minutes. For a protective coating, use the clear glaze spray paint. After it’s all dried, remove the painter’s tape and add your flowers inside. With Valentine’s day coming soon, let’s be a little bit of romantic, shall we? Surprise your beloved one with a vase with something symbolic, as the heart with names on it as it’s shown on the picture. 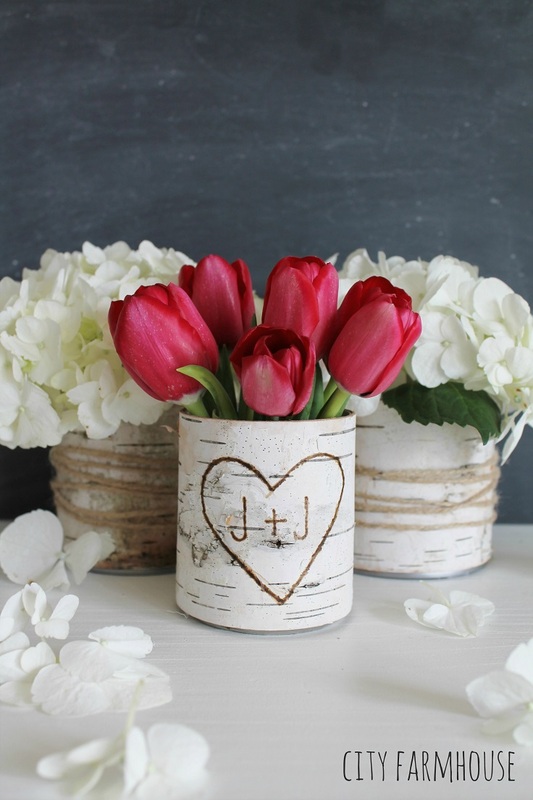 For this project you need birch bark, twine, tin cans as vases, glue gun, glue sticks and wood burning pen, if you want to write something on the vase. Wrap a birch strip around the tin can and secure with glue. When dried, wrap a twine around the can and make a ribbon. With the help of a wood burning pen, slowly write or draw what you want and that’s it! The gold gilding paint has the power to make almost everything look as if you bought it for hundreds of dollars or more! In the vase case, it makes them look very elegant and expensive, especially in this project with a combination of black. You need black, ceramic vases, gold gilding paint, narrow painter’s tape and turpentine. Use the narrow painter’s tape to separate the vase into two sections. Choose the one you want to be gold and paint it with brush. After it’s dried, remove the tape and you have your vase all ready and looking fabulous!